I was alerted by an Apple Development Executive I know back in the spring that he had nominated me to apply for the "Apple Academy" that would take place in the summer of 2010. I wasn't exactly sure what Apple Academy was. I was familiar with the Apple Distinguished Educator program and found out that this was not that. What it turned out to be was 95 selected educators from around the country that would come to Cupertino, California and learn as much as you could about Apple's tools, programs and methods for educating students. I found out I was accepted and eagerly awaited August 15 when I would fly out to California. I write this post just one day after getting back from California and my head is still buzzing. 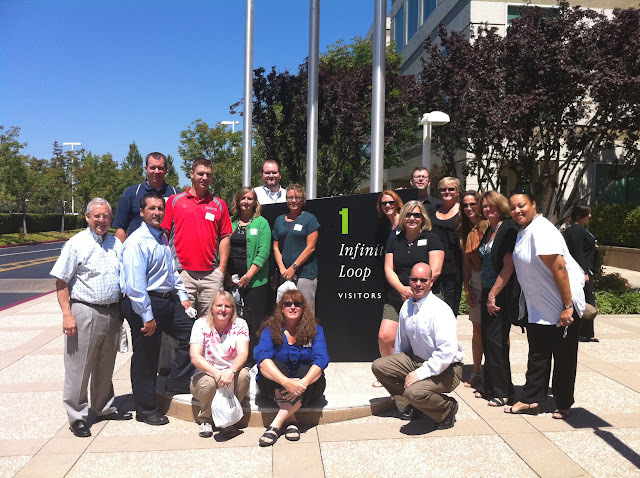 There were 18 of us at this section of the Apple Academy. We were the 5th and final Apple Academy for this year. Peter Tullio (K-12 Education Marketing for Apple) and Pete Vraspir (Trainer) did an excellent job leading and equipping us with knowledge that we could apply in the classroom. We worked on parts of an overall project all week around the topic of Mars. All the materials (pictures, videos, scripts, documents) were created ahead of time so we could use the Apple tools to go through the motions for how these pieces of a project could be enhanced. I enjoy learning "hands on" so this was very helpful to already have the research and the basics covered so we could go deeper into the programs. We were also able to offer ideas, suggestions and "feature requests" directly to Apple as we used these products. I found this to be very empowering as I have used the iLife suite extensively and was able to offer some insight from my role as an educator on how the tools could be enhanced or tweaked. 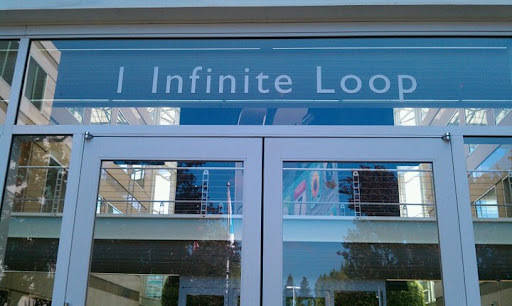 We visited the Apple Headquarters campus (aka, "the mothership") at 1 Infinite Loop on Tuesday for lunch. It was very exciting to see the main headquarters and the people there. I am a big fan of the "California dress code" as they don't really dress up much to go to work! :) The campus was gorgeous and Cafe Macs (food area) had everything possible you could imagine. No Steve Jobs sightings unfortunately though we did learn that he doesn't have license plates on his car and we could see where his office was from the commons area. WHAT I HAVE LEARNED THIS WEEK? Day 1 - Foundations: We learned how the week would work. We would be keeping our information on an isolated OS X Wiki server so we explored how to use that. We looked at some tips/tricks in the Finder and explored how our iPad and iPod Touch were set up for us to use this week. Day 2 - iWork: In short, we explored the iWork suite (Pages, Numbers, Keynote) on the iPad and on the MacBook. Our projects for the week were based around information collected on the planet Mars. Day 4 - Curriculum: We went through the areas of Math, Science, Humanities, Language Literacy and Special Education and learned some ways and resources to teach in these areas with Apple tools. Day 5 - Taking It Home: This half day was centered around reflecting, wrapping things up, packaging up our files to take home and also to start thinking about how we would share out what we had learned. The information I learned is too much to put into one blog post. I'll talk in the next section about HOW I will be using this information. As for what I learned? I learned many new ways to engage the teachers I work with and the students I teach. I learned that some of Apple's tools were created with the educator and student in mind and I'm excited to share that with others. WHAT IS MY PLAN FOR SHARING WHAT I'VE LEARNED WITH OTHERS? I'm most excited to share what I learned this past week with the students I will be teaching in my 8th Grade New Media and Computer Applications classes. I'm also excited to share this information with teachers so they can pass on what they learn to their students. I did a lot of sharing over Twitter while I was at the Apple Academy using the #appleacademy tag so if my tweets are still there, you can learn some of what I was learning real time! Part of attending the Academy is creating a portfolio which I will be doing on my website to share out what I learned. I teach and lead various workshops for my district and various groups I work with so I'm excited to incorporate some of what I have learned into my presentations. I also plan to share out some of the tips here in my blog when I can find the time to synthesize the information in a way that will benefit the reader. The network of Apple Academy attendees is starting with these 95 people from this summer and will be growing. The group I worked with at my section of the Apple Academy was very interested in continued networking which only helps me to personally develop my Professional Learning Network. The knowledge gained on these tools was very extensive and I even learned more on things I thought I already knew a lot about like the iLife suite. I'm very grateful to have attended this excellent event and look forward to continued networking with the group I spent time with this week. Below is a link to my photo album from the week.